Properly dubbed for its namesake, the Multi-Cooker is a culinary tool with multiple functionalities. 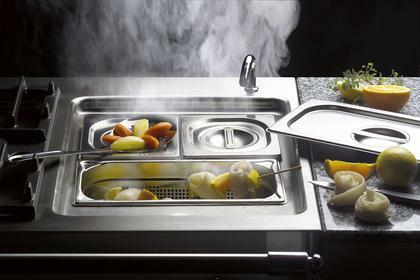 It can be used as a steam cooker, a waterbath for cooking pasta or boiling vegetables, or as a bain-marie. STEAMER – Steaming cooks things quickly with a high level of moisture contact, while preserving their nutritional qualities and leaving original flavors intact. This method of cooking is especially suitable for some vegetables, fish and also white meat. It also enables dishes cooked in advance to be kept warm until it is time to serve them. “BAIN-MARIE” – Allows the cooking of any preparations needing a soft, gentle, controlled temperature that does not allow food to come into direct contact with steam, but the bottom of the pan may (Bain-Marie) or may not (double-boiler) directly contact the hot water bath. Ideal for custards & classic warm sauces such as Hollandaise & Beurre Blanc or melting chocolate. Also functions as a chaffing dish. BOILING – Allows the cooking of dishes through complete immersion in a controlled temperature bath with either direct or indirect contact like Sous-vide (although this does not circulate the cooking water). Excellent for boiling pasta or veggies. To garner maximum results from your Multi-Cooker, a 5-piece starter accessory kit will be included in your purchase (retail value of $875). This kit includes: (1) Extension, (1) Cover for Extension, (1) Large Perforated Steam Basket, & (2) Pasta Baskets. Additional accessories available for individual sale. Only suitable for models with a Warming Cupboard that will be converted to a storage cupboard to accommodate Multi-Cooker. Induction is the latest development to be adopted as a heating method for cooktops. This technology uses the principle of the electromagnetic field – which is why it requires cooking utensils that have bases containing ferromagnetic material (i.e. cast iron or magnetic stainless steel). Inductors linked to an electric generator are located under a glass-ceramic surface, which acts as support for the cooking utensils. Induction gives very precise control of cooking temperature, and because inductive heating directly heats the vessel, very rapid increases in temperature can be achieved. Only the area in direct contact with an appropriate pot or pan will heat up, while the remainder of the induction surface remains cool. Two Induction Rings are now available with varying power and size (145 mm diameter – 1400W- 1800W & 200 mm diameter – 1850W-2500W). Cookware of various sizes can be used thanks to a well-planned layout combining zones of different heating power. 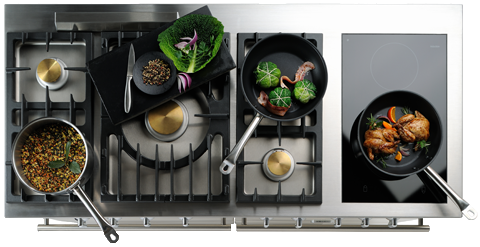 Only available with certain cooktop configurations; please visit our Configurator tool to verify compatibility. The front controls, with ‘power on’ alert, allow rapid and easy adjustment of heating rates. Power-level indicators beneath the transparent glass-ceramic surface give you visual control over how the heating zone is responding. Instant adjustment: The most favorable advantage of induction cooking is the ability to adjust cooking heat instantly and with great precision. Unlike other electric cooking methods (coil, halogen heater, etc.) which requires incredible inertia to adjust between heat temperatures, induction is instantaneous like gas burners. No wasted heat: With induction cooking, energy is supplied directly to the cooking vessel via electromagnetic field; thus, almost all of the heat produced gets transferred directly to the pot or pan being utilized. In contrast, with gas or traditional electric cooking methods, energy is first converted into heat and then transferred to the pan resulting in large amounts of heat waste (into your kitchen). Additionally, the stovetop itself barely gets hot (just the residual heat remaining from the base of the cooking vessel). Safety: The stovetop itself will remain cool meaning no burnt fingers or hands for yourself or young children. Because energy is transferred only to materials with relatively large amounts of magnetic materials (at least that amount in a small pot or pan), your “non-ferrous” hands won’t be of concern even while wearing metal jewelry. Cookware compatibility: Induction is only compatible with certain types of cookware (those composed of magnetic materials i.e. stainless steel and cast iron). Do note that not all stainless-steel cookware works equally well on induction, as much depends on the layering of metal within the pot or pan. Most manufacturers will state whether or not their products are induction compatible or another simple test is to take any magnet and see if it clings to the bottom of the pot or pan. Aluminum, copper, glass and pyrex cookware will not be compatible with induction. Generates “humming”: Humming sound while cooking or boiling is normal. Slight sounds, like hums or buzzes may be produced by different types of cookware. The base of most “Clad” cookware has a sandwich of layers of several different metals (typically steel outside, aluminum or sometimes copper in the middle, and more steel inside). If the middle layer is merely encapsulated in the steel, as opposed to being actually welded within it, it can move about. While microscopic, this play can give rise to a sort of “buzzing” noise. Heavier pans, such as enameled cast iron produce less noise than a lighter weight multi-ply stainless steel pan. The size of the pan and the amount of contents can also contribute to the sound level.